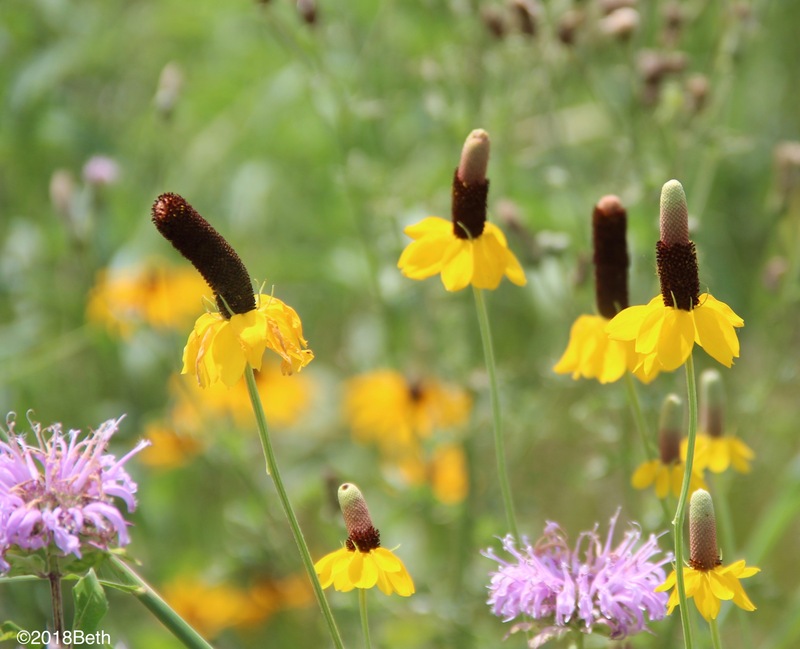 Monarda, coneflowers, black-eyed Susan’s and big bluestem stretch across a prairie restoration area. When I was young, I loved to imagine what life on the prairie would have been like in the 1800s. Inspired by Willa Cather’s novels, it wasn’t the rigorous lifestyle that attracted me, but rather the beauty of the land — nothing but open sky overhead, the sweet music of meadowlarks and bluebirds, a sea of wildflowers and native grasses. Long-headed coneflowers (Ratibida columnifera) are a native prairie wildflower and attract many species of butterflies and bees. 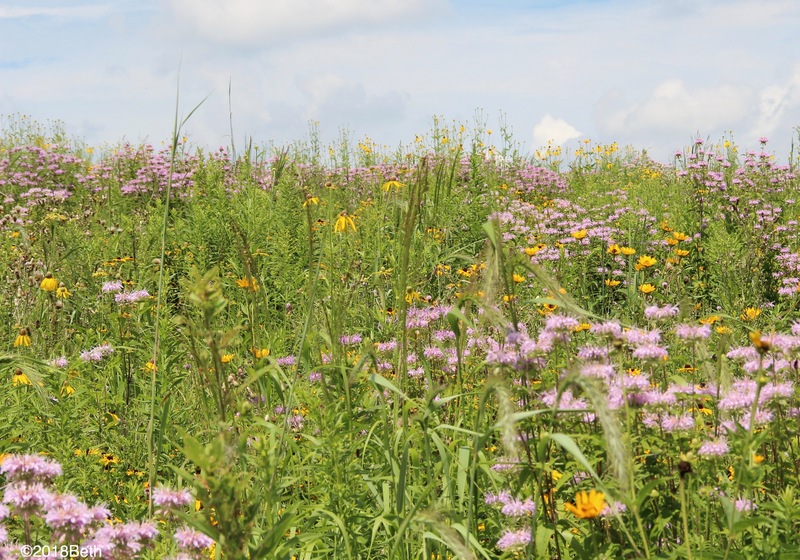 Fortunately, there are many places in the state where prairie restoration is underway. Two wonderful prairie habitats in Minnesota are Blue Mounds State Park near Luverne, MN, and the Jeffers Petroglyphs near Comfrey, MN. Blue Mounds features 1,500 aces of tallgrass prairie, a bison herd in its native surroundings and beautiful rock outcroppings of Sioux quartzite, which look purplish to blue depending on the light. Jeffers Petroglyphs also includes prairie and prairie restoration. The Sioux quartzite contains ancient symbols, some as old as 7000 years and the most recent thought to be 350 years old. We don’t know which American Indian nations carved the original symbols, which include thunderbirds, turtles, deer, buffalo and humans. When I visited, our guide emphasized the sacred nature of this place to American Indians and asked us to treat it with reverence. When I took time to stop and listen, I felt presence and peace there. 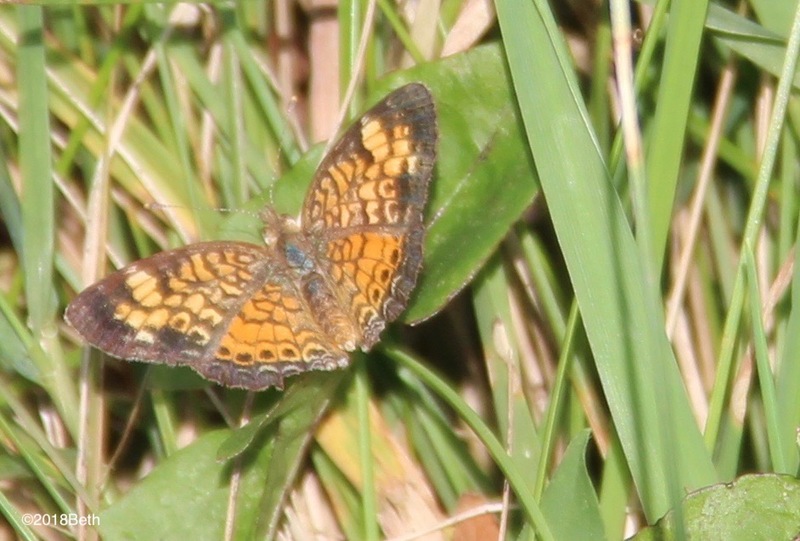 Pearl crescents (Phyciodes tharos) are common on the prairie and grasslands during August and September. 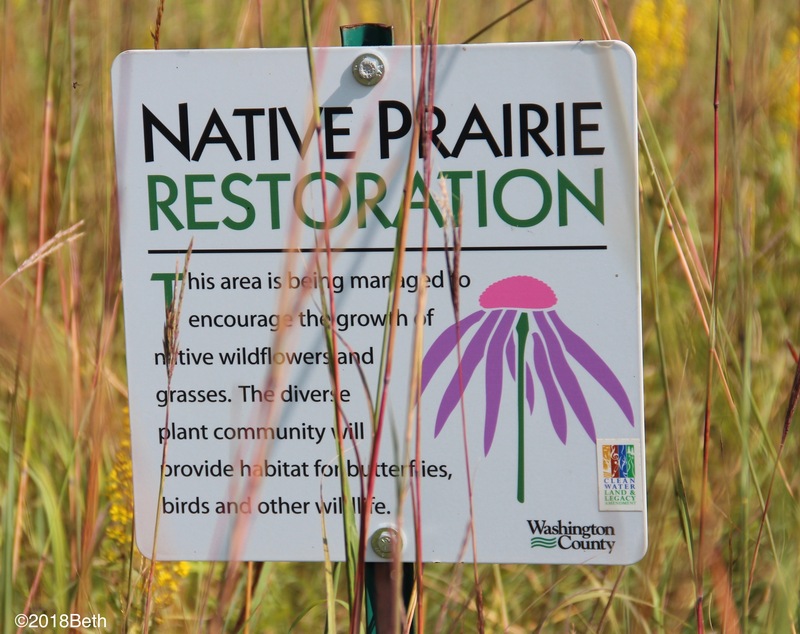 Native prairie restoration at Lake Elmo Park Reserve. I recently walked on a trail through a much smaller prairie restoration area at the Lake Elmo Park Reserve: Big bluestem, butterfly weed, blazing star, coneflowers, black-eyed Susans, goldenrod and other forbs roll in wind-swept waves; the sound of swishing grass beneath a symphony of crickets, grasshoppers, katydids, bumblebees and other singing, buzzing, chirping insects; migrating monarchs floating everywhere. I close my eyes and listen: How expansive and lovely this land must have been before settlers arrived. Let us teach our children the value and beauty of the prairie. 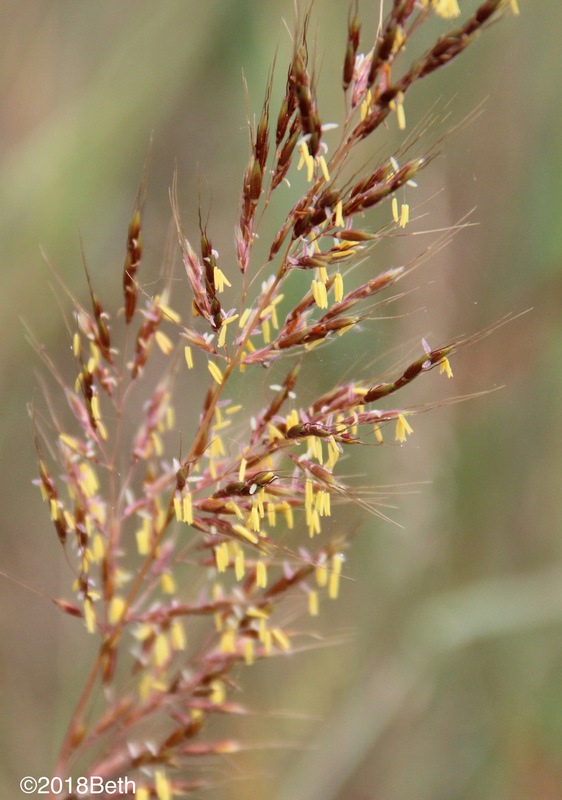 Indian or wood grass (Sorghastrum nutans) has bronze and yellow flowers. 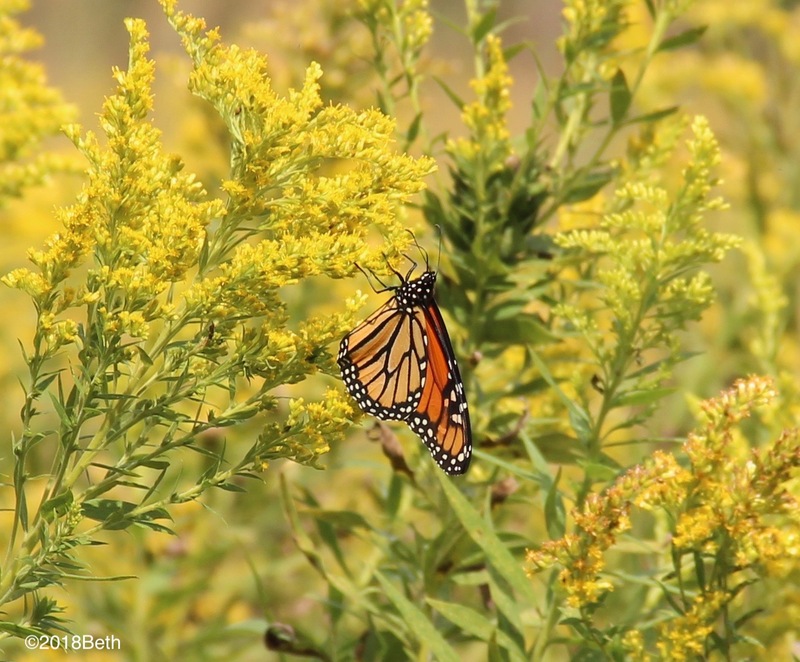 Goldenrod (Solidago spp.) is a major source of nectar for migrating monarch butterflies. 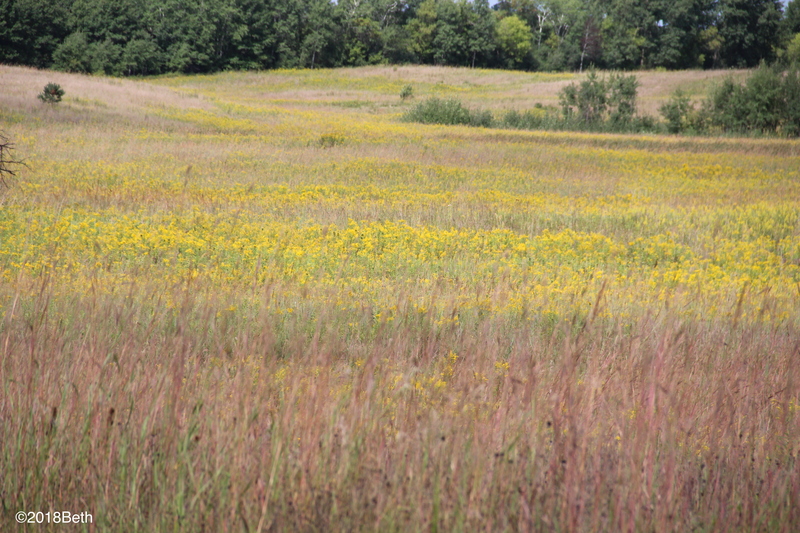 Goldenrod, big bluestem and other native grasses and forbs bloom in a swath of restored prairie at Lake Elmo Park Reserve. ¹Minnesota DNR overview of the prairie biome. ²Minnesota DNR prairie conservation plan. Prairie smoke (Geum triflorum) sports five dark pink outer petals over five white inner ones. The Midwestern prairies are famous for their large, showy flowering plants like purple coneflowers and black-eyed Susans. But, there are lovely smaller ones, too. 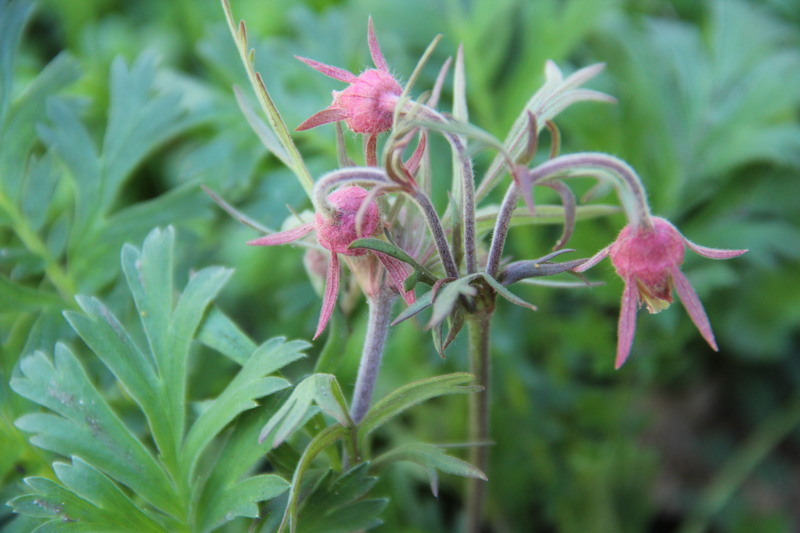 Prairie smoke (Geum triflorum) is an interesting one that grows in early spring. Fern-like, hairy foliage often stays green all winter and begins growing in early spring. Each spring, the melting snow uncovers a green rosette of hairy, fern-like leaves often tinged with burgundy. The rosette begins to grow, and a few weeks later, one or more stalks appear in the center of the rosette. Each carries a small group, or umbel, of three flowers. The five outer petals are pink-to-reddish colored and tightly cover five white petals forming a bell-like shape. Because the small flowers barely open, they are primarily pollinated by bumble bees, which are burly enough to push inside. Prairie smoke seed plumes on last year’s plants. After several weeks, the flowers turn upward and form small, one-seeded fruit that are attached to long styles covered with silky hair. 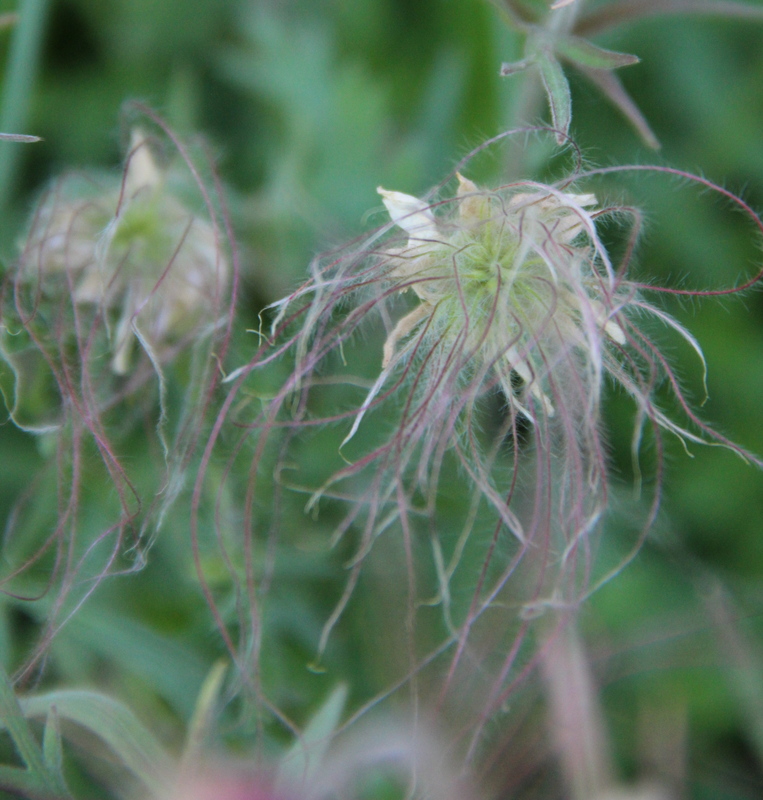 The wispy appearance of the fruit led to the colorful names of prairie smoke and old man’s whiskers. 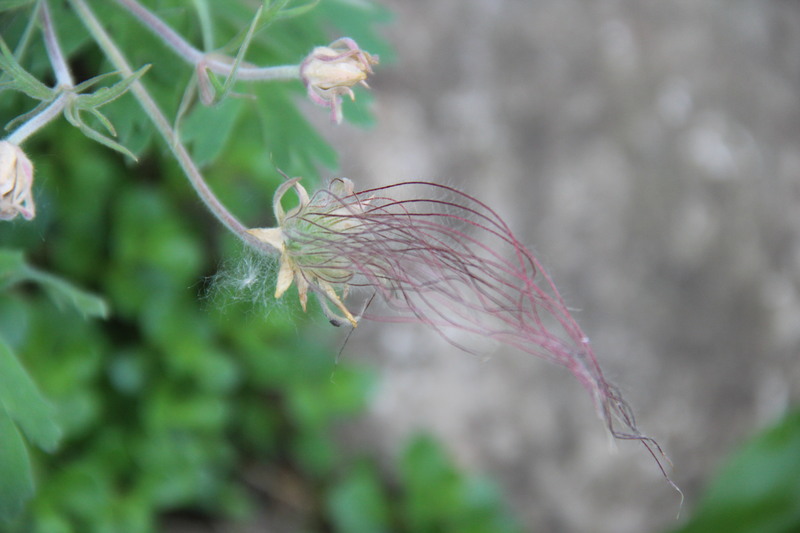 Another seed plume of prairie smoke or old man’s whiskers. 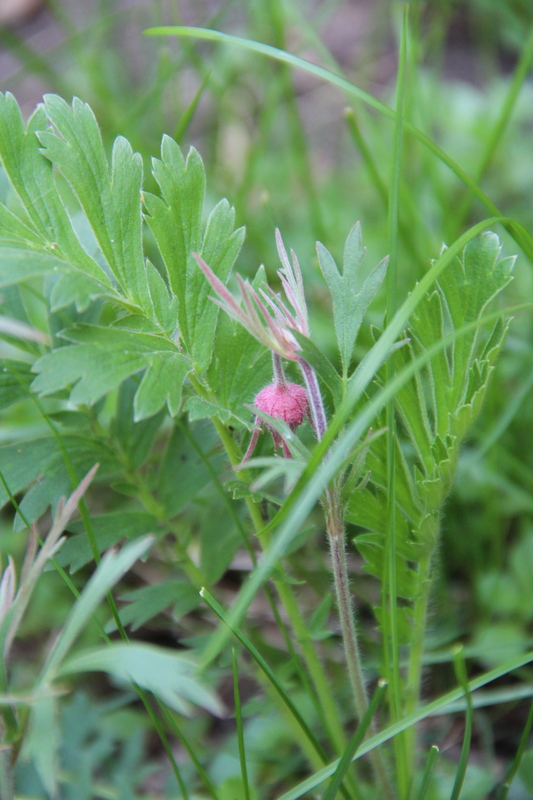 In its native habitat, prairie smoke prefers sunny, dry soil that is rocky or sandy. In our garden, it’s happy growing near the top of a limestone wall where it receives direct sun and has good drainage.